About Milbocker & Sons, Inc.
Like many construction companies that have helped build Michigan's infrastructure, Milbocker & Sons, Inc. had a very modest beginning. When started nearly 60 years ago, the company headquarters were located on the family farm. At that time they employed roughly 20 people and possessed fewer than 10 pieces of equipment. Six decades later, Milbocker & Sons, Inc. employs nearly 130 people annually. The steady growth of the company and its solid reputation for producing quality work has helped ensure its future success. Those who are familiar with Milbocker & Sons, Inc. are well aware that it is a serious oddity in this industry. Part of the company believes that it is a bridge builder and the other part believes that it is an excavating and road building company. In an industry where rising equipment costs, increasingly strict safety requirements and the mounting demands of project engineers has pushed most companies into specialization. Milbocker & Sons, Inc. successfully does both. Today, the company's workload is divided between underground excavation, site clearing, road building and bridge work. 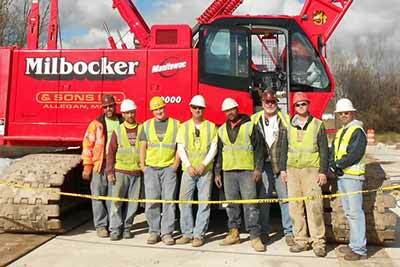 Milbocker & Sons, Inc. is located in Allegan Michigan. We are a statewide contractor although the majority of our work is done within 90 miles of our office. We currently do not perform work outside of Michigan.